Hello! Today I have an Essie swatch to share with you. While sorting out my polishes recently, I realised that my little Essie collection doesn't get much love. I think I only have around 10 total, and I haven't actually worn most of them properly. I decided to pull out one to try - I went for 'Cascade Cool', I always choose pink! Read on for my swatch and more info! 'Cascade Cool' is a lilac-toned pink creme, described by Essie as 'a creamy, sweet, dusty pink'. The formula was much better than I expected, it was so easy to apply and completely opaque in two thin coats. This also had one of the flat wide brushes which I find much easier to use - I had barely any clean up to do. Below is two coats and topcoat. What do you think? I really like the fact it's not a plain pink, it has that lilac tone which makes more unique. Plus I was very impressed with both the formula and the ease of application. Essie seems to have quite mixed reviews so I think I'll have to try a few more and see what I think! It really is a beautiful shade of pink! I've come to really love Essie lately, and this one looks so good with your skin tone!! Love this colour and boy does it love you. I always tend to avoid these shades and stick to true pinks/purples but I may have changed my mind after seeing this. 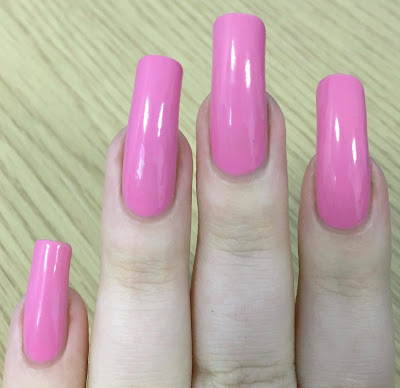 Pinks are almost always so perfect <3 It looks good on your long nails! !